Being the first overall pick in an NBA draft gives you instant recognition within the hobby, but you also have to deliver. 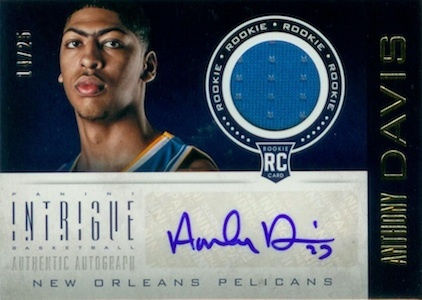 "The Brow" has done that, and more, making Anthony Davis rookie cards very popular. Helped by his obvious talent, the only thing holding Davis back from the upper echelon of basketball collecting is a winning team with true title potential. Largely matching and even exceeding the expectations, Davis is one of the most dominant big men in today's NBA. 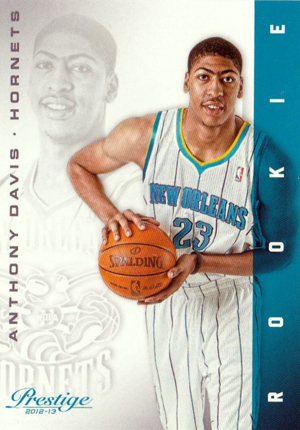 Similarly, Anthony Davis rookie cards have proven to be nearly as formidable with collectors. 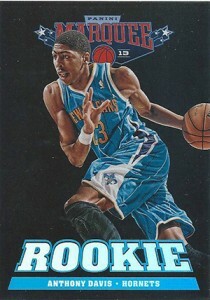 Anthony Davis rookie cards are found in 2012-13 NBA products from Panini. They are available at all price points, depending on your budget and collecting preferences. Below you will find details and images for all of Davis' rookies. Shop cards on eBay using the using the headings or images below. Linked sets in the descriptions go to detailed product guides. 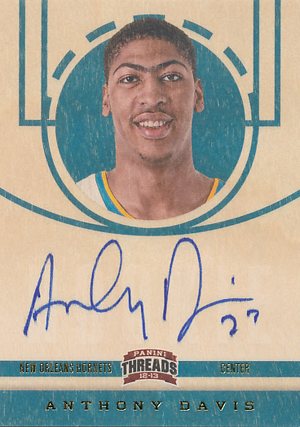 A low-end option for collectors, the 2012-13 Panini Anthony Davis card has a simple but attractive base design. There are no major additions, letting the affordable card stand on its own. 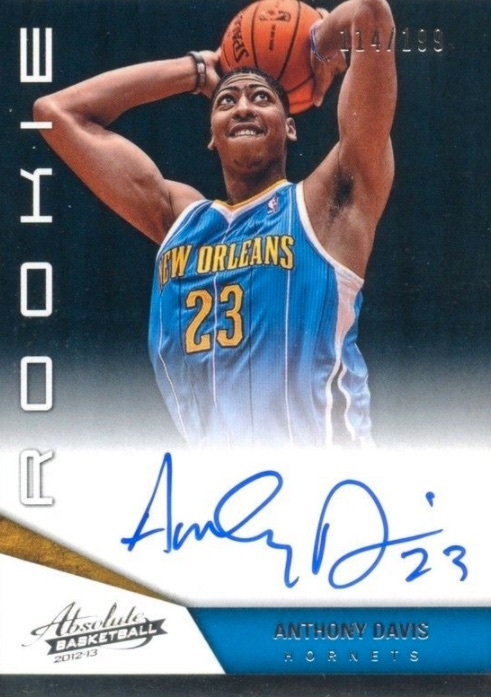 Originally inserted into packs as a redemption, the Anthony Davis rookie in 2012-13 Panini Absolute has an on-card autograph. The small print run of 199 copies makes it one of his more popular rookie autographs. 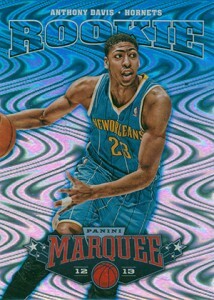 In case you can't tell from the image, 2012-13 Panini Brilliance loves embossed foil. 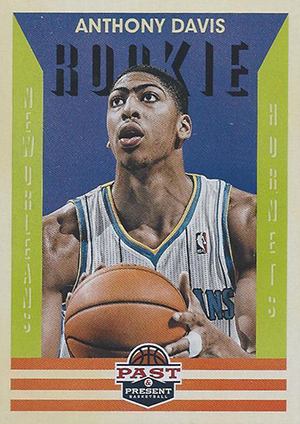 It gives the card an unmistakable look that helps separate it from the long list of Anthony Davis rookie cards. 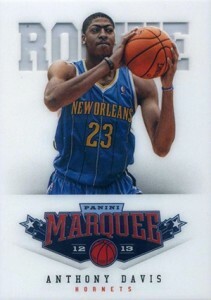 2012-13 Panini Contenders Basketball has a wild, liquid-like design for its first-year subjects. It's a big departure from the Rookie Ticket concept used extensively by the brand in the past. However, one aspect that remains the same is the fact that the rookie signatures are not serial numbered. 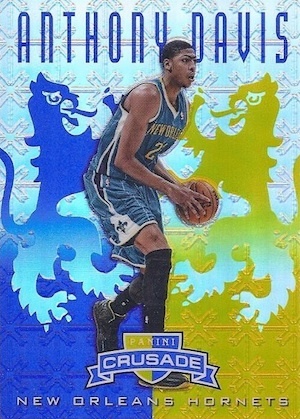 With a lot of collectors hunting for the Crusades inserts, the '12-13 Panini Crusades base set might be somewhat overlooked. 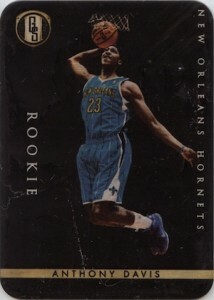 The card is definitely one of the cheaper Anthony Davis rookie cards. In addition, his popular Crusade insert is shown. 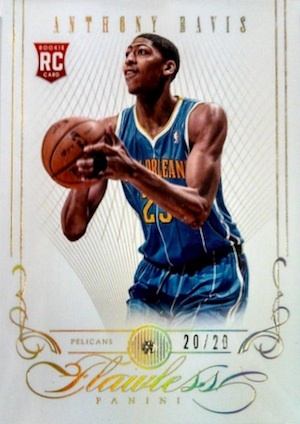 Sticking with the brand's tradition, 2012-13 Panini Elite rookies come with a foil design. The major selling point is the serial numbering, which limits the card to 599 copies. Davis' Elite Series rookie is a top base option for collectors. The lower print run and elegant design make for an appealing alternative to traditional base rookies. However, watch out for fingerprints on the 2012-13 Elite Series cards. 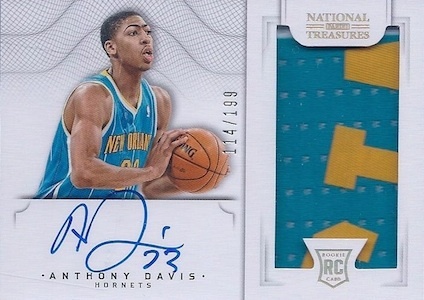 An obvious play on the diamond inclusion, 2012-13 Flawless showed that there is really no amount too high for basketball collectors. 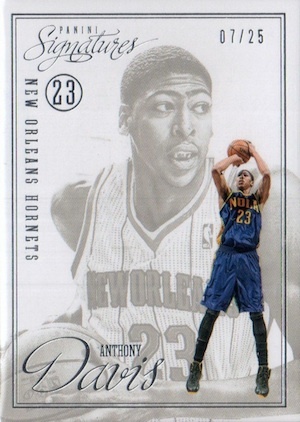 This base rookie card for Anthony Davis includes the aforementioned diamond and a print run of only 20 copies. 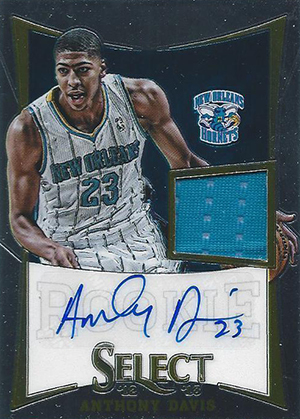 The on-card autograph and rectangle jersey piece offers collectors an attractive Anthony Davis rookie card. Coming as no surprise, the 2012-13 Gold Standard design is heavy on gold and the on-card autograph is a major plus. 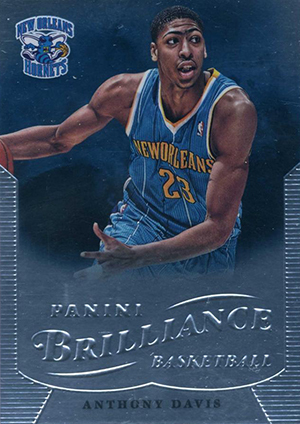 Alongside Flawless and National Treasures, 2012-13 Panini Immaculate completes the trinity of Davis' ultra high-end rookie cards. A hard-signed autograph and a clean, Exquisite-esque design make for one impressive card. 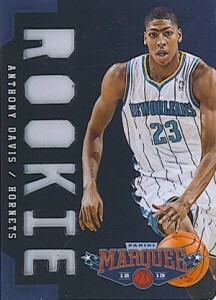 Admittedly, the 2012-13 Innovation rookie card for Davis features a bizarre image choice. The open-mouthed stare of a man contemplating a free throw shot does not do justice to the beast within. Despite this, the acetate stock and lower print run makes this a great budget option that will be harder to track down as time goes by. 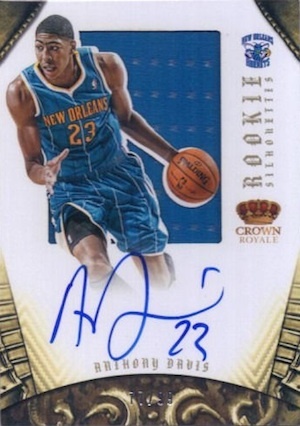 While low-numbered rookie cards are nothing new, the combination of a a sticker autograph for the number one pick and print run of 25 seems a little crazy. Unremarkable as it is, the print run alone keeps the 2012-13 Intrigue card's value higher. Rookie cards in 2012-13 Panini Limited come with a very distinct look as all are autographed on die-cut acetate. 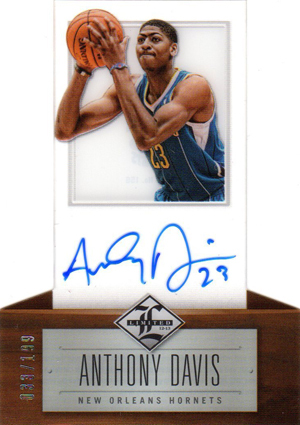 The Davis card is numbered to 199, which is still on the lower side of things compared to most of the list. 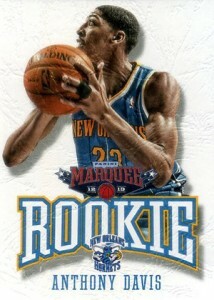 2012-13 Panini Marquee goes big with its rookie cards, both in quantity and style. 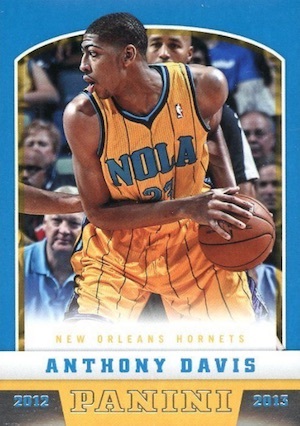 Anthony Davis has five different base cards in the set, all of which display a drastically different look. Swirlorama (#152) utilizes a foil effect while card #232 showcases something called Black Holoboard. The Laser Cut (#312) card has a die-cut "Rookie" down the side and the Leather card (#392) is the rarest and most valuable. 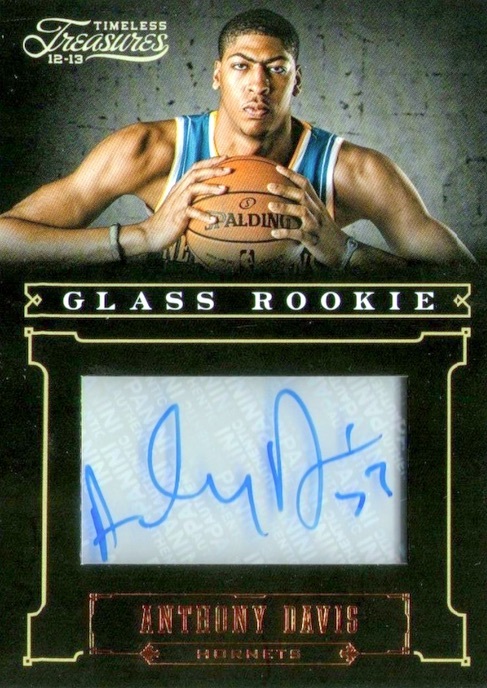 Finally, the last Anthony Davis rookie in the base set is done with acetate. For those who like simple designs, 2012-13 Panini Momentum isn't a bad choice. It comes from a premium set that's more focused on hits and inserts than the base cards. As a result, the card is somewhat rare despite not being serial numbered. 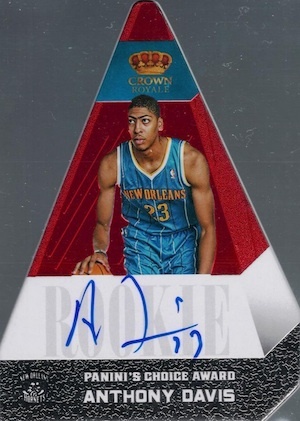 A large jersey patch and on-card signature along with the brand recognition of National Treasures come together to form one of the best Anthony Davis rookie cards of the year. Although the higher-than-normal print run may hurt values slightly, it gives more collectors a shot at obtaining this nice 2012-13 NT card. The 2012-13 NBA Hoops rookie for Davis comes from a set that aims for wide appeal. It's a low-end card designed to kick off the new season. The card features a posed portrait that looks like it's primed for the NBA yearbook, and Davis' suit almost disappears into the background. Because it comes from an entry-level release, there are plenty of cards to go around at low prices. This P&P card is for collectors who like the old-school vibe. For some, the best part about the throwback nature of 2012-13 Past & Present is the price tag as this is one of the star's cheapest rookies. 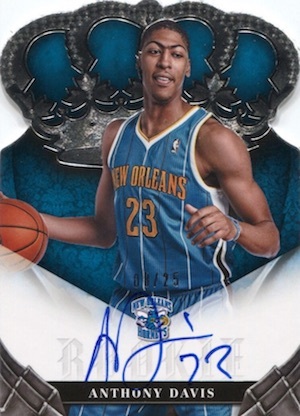 Merging multiple designs into the same base set, 2012-13 Preferred has three different autographed Anthony Davis cards. The Rookie Silhouettes versions, especially the prime parallel, have been the most popular of the group, but all three offer a limited print run and on-card signature. 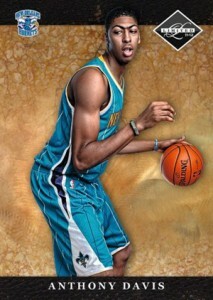 Another cheaper option, the 2012-13 Panini Prestige card was his first rookie on the market to show him in Hornets gear. The design is clean, with lots of white space alongside a pair of photos. 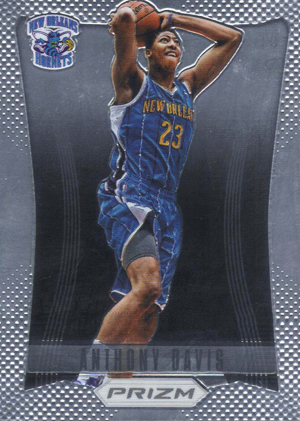 The 2012-13 Panini Prizm Anthony Davis rookie card is a great pick for those without the funds for an autograph or extremely limited card. 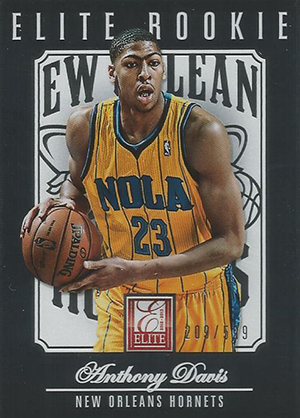 The card has a chromium look, something missing from the basketball card market for several years. Prizm parallels are also popular. Besides the base set, Davis is also featured in the USA Basketball insert set. 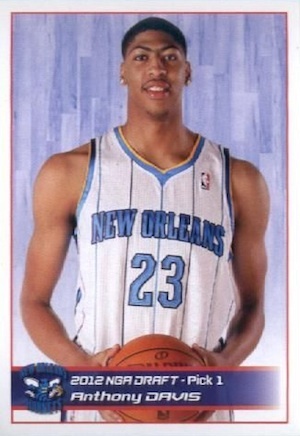 Anthony Davis has two different rookie cards in 2012-13 Select Basketball. Both come with autographs and are numbered to 149, with the second card (#270) adding a jersey piece. 2012-13 Panini Signatures does not have a typical product format. While there is no true base offering, the Chase Rookies set basically assumes that role. Each player has ten cards, all featuring different images, and every card is numbered to 25. 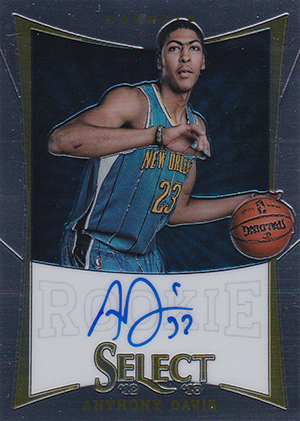 This larger quantity of low-numbered cards makes it a little easier for collectors to snag the rookie of an elite player like Anthony Davis. Simple and to the point, there is no fluff with Panini's line of sticker cards. 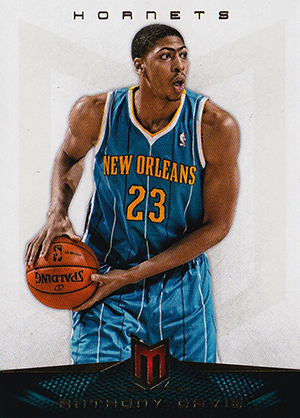 It may not be the top choice among Anthony Davis rookie cards, but '12-13 Panini Stickers is a great way to keep young collectors involved with top NBA players for a fraction of the cost. 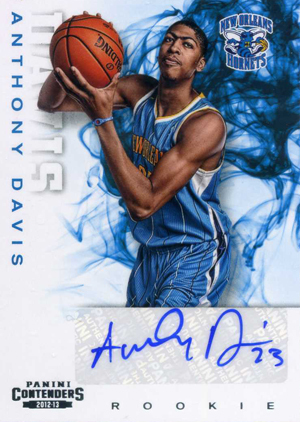 Although Panini featured Davis' signature heavily in earlier products, 2012-13 Panini Threads has his first autographed rookie card. While that makes it notable in its own right, it's also printed on wood card stock, giving it an even more distinct look and feel. One of the more unique entries, the 2012-13 Panini Timeless Treasures Glass Rookie cards have autographs with a see-through design that gives the appearance it's floating. 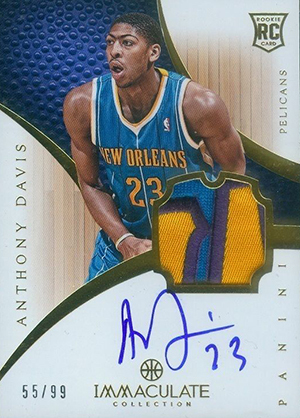 Numbered to just 188, Anthony Davis is by far the toughest to find in the subset. Most other rookie players have either 399 or 499 copies. 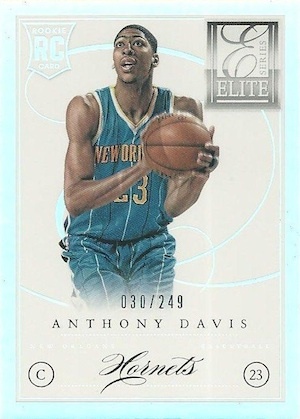 The 2012-13 Panini Totally Certified rookie card for Anthony Davis arrives with the subtlety of an elephant in an elevator. Loud and proud, the etched foil design is unmistakable. Among unnumbered rookies, this is one of the more valuable options but still in reach for most collectors. 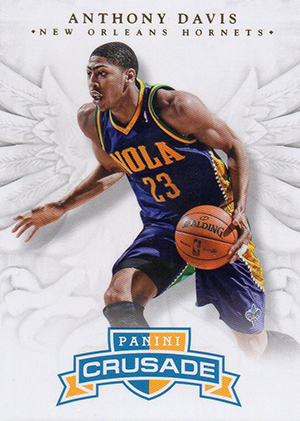 As part of the final three 2011-12 NBA products, Panini inserted redemption cards for 2012 draft picks. Numbers were paired with their draft position. 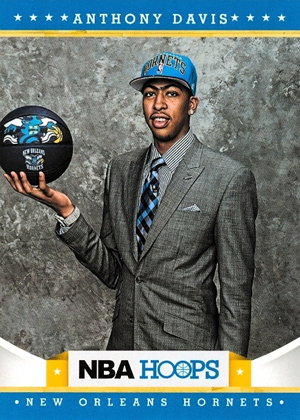 As the first overall pick, Anthony Davis is redemption card #1 in each of the three sets. These should not be confused with the 2011 draft redemptions, which also have autographs. 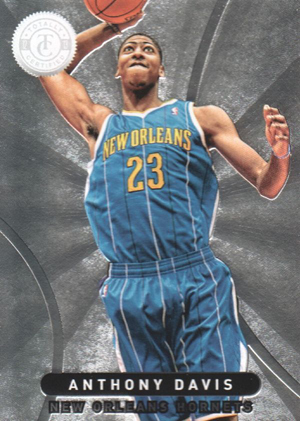 ANTHONY DAVIS 2012 INTRIGUE ROOKIE GOLD RC CARD #5 10! 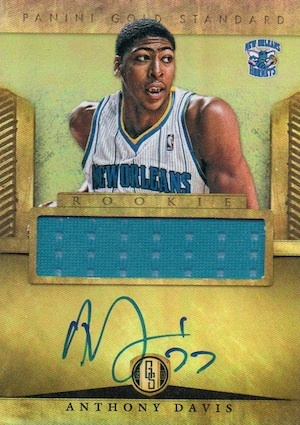 2012-13 Contenders Anthony Davis Hornets RC Rookie AUTO "TRUE 1 1"!!! !